Tap a message that you’ve received and then tap Details. Tap Send My Current Location, and a map will be inserted as a message attachment. 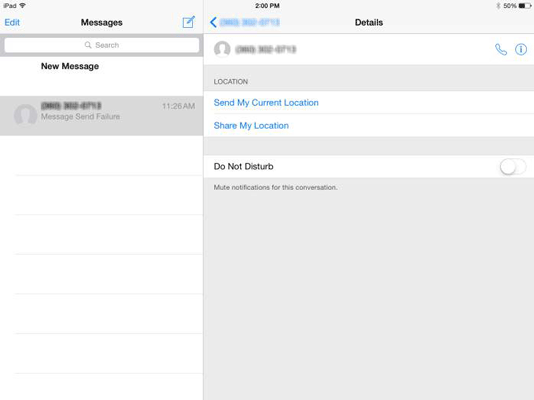 If asked, tap Allow Messages to Access Your Location. Don’t let this freak you out. How else will your iPad know where you are to send your location? You can also share your location in the middle of a conversation rather than send a map attachment with your message. Tap Share My Location and then tap Share for One Hour, Share Until End of Day, or Share Indefinitely. A map showing your location will appear above your conversation until you stop sharing. Just keep these tips in mind the next time you need to meet up with a colleague or friend and finding one another will be a simple task.